De-cluttering = Disencumbering Your E-mails, too! De-cluttering can be a challenge at the best of times. We all have our goals of when and what to discard. It seems like it never ends. Today I’m discussing de-cluttering our e-mails. I spent last Saturday with my family. (I blogged about it on #365daysofjuneday 9) That meant I spent the day not looking at my e-mails, except before leaving in the morning, until the Sunday morning. It is easy to check your e-mails from a Smart Phone while lying snug under the covers in your bed on a cold morning with Ninja Buddy tucked behinds my knees sleeping away. Sunday morning’s e-mail greeted me with 465 messages in my inbox. I deleted 48 messages in the morning before leaving on Saturday. I didn’t empty my deleted folder. I prefer to manually empty it in case I need to close my e-mail before reviewing the folder. I like to review my deleted folder before emptying in case I accidentally moved an e-mail in it. 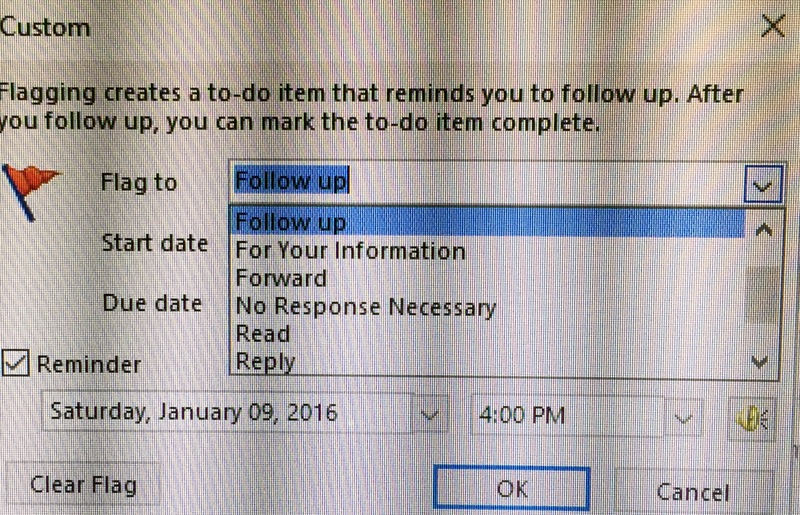 I right click the follow up arrow, giving me multiple choice of how I want to follow up with this e-mail. I use it like my “To Do” List. 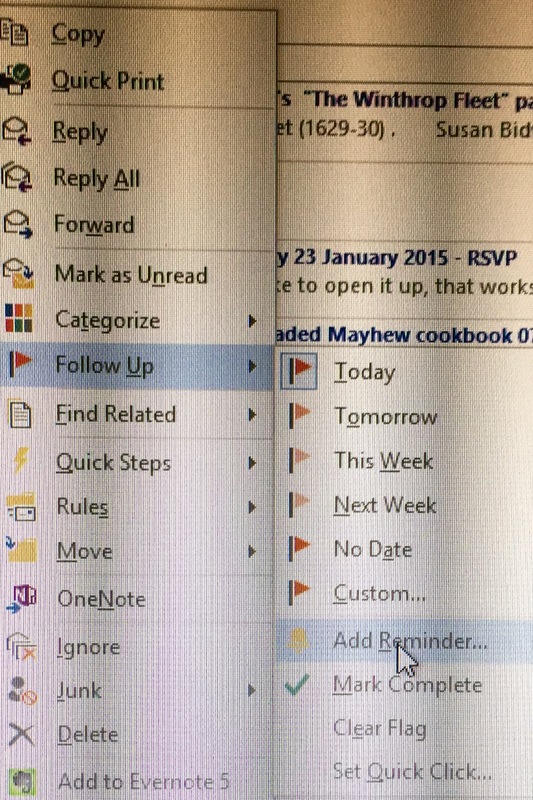 In the top of the two images above you see arrows by the date to right click on, change it to the day you want to follow up on that e-mail. 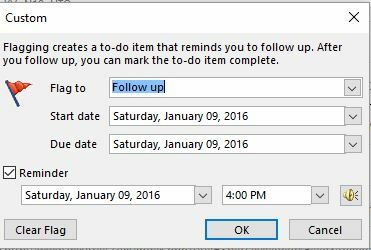 I use this option as a reminder for upcoming webinars, when to follow up to a “cousin” e-mail requesting family information or just to postpone the reading to a convenient time. I will respond to the “cousin” e-mail with a follow up of my response. I like to verify what I may be sending, including source/s where I found the information, so they may view it themselves, if they choose. Sometime when I don’t get to the follow up at the scheduled time I get a RED highlighted e-mail along with the pop-up reminders it gives you on the day and time you scheduled it for. Now to the fun part, HOW to reduce the number of e-mails and still follow your friends, groups and pages on Facebook. I found most of my e-mails with Facebook notifications. When I first join a page, group or accept a friend I keep the notifications on. I “cruise” the pages, so to speak. When l eventually know and feel comfortable with them I decide if notifications stay on or off. Friends: If a newly accepted friend only posts game invites, they will be unfriended by me. I DON”T DO GAMES ON FACEBOOK, PERIOD. If my friend post other interests I want to view I turn of notifications and go to their timeline at my convenience. 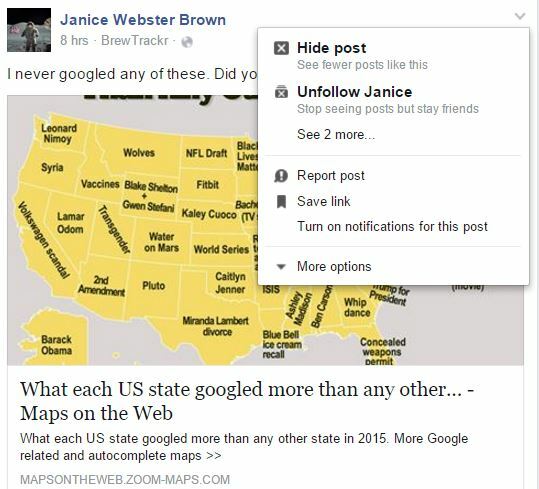 I will still get the post on my Facebook feed, unless I un-follow them. Facebook doesn’t post all posting, as you probably have noticed, that is why I go to the person timeline to update what is happening with them. Pages/Groups: Is a little different for Pages/Groups. When I join a group/page I leave the notifications on until I’m comfortable. I turn off notifications at that point. I can follow Pages/ Group by looking on the left side of my home page. I can click on each one, at my convenience, to become updated on what is happening. 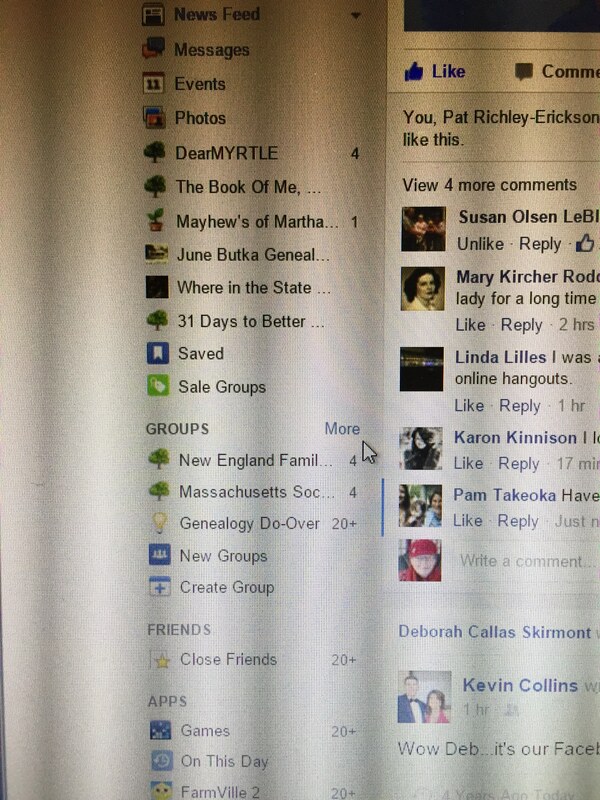 The image below shows my Pages/Groups/Friends; how many posts were made since I last looked at their Facebook timeline, with a number to the right of the title. I do the same thing for newsletters I subscribe to. I “Cruise” for a while, decide if continuing with the newsletter or just go to the web page when I want something. Making these few changes can reduce the number of e-mails in your inbox. YOU HAVE CONTROL, when you want to receive and when to stop. I would like to say I try to update my notifications monthly, I’m human, life gets in the way. I know it is time to revisit when I go one day without e-mail and find over 400 waiting in my inbox the next day. Take Control! 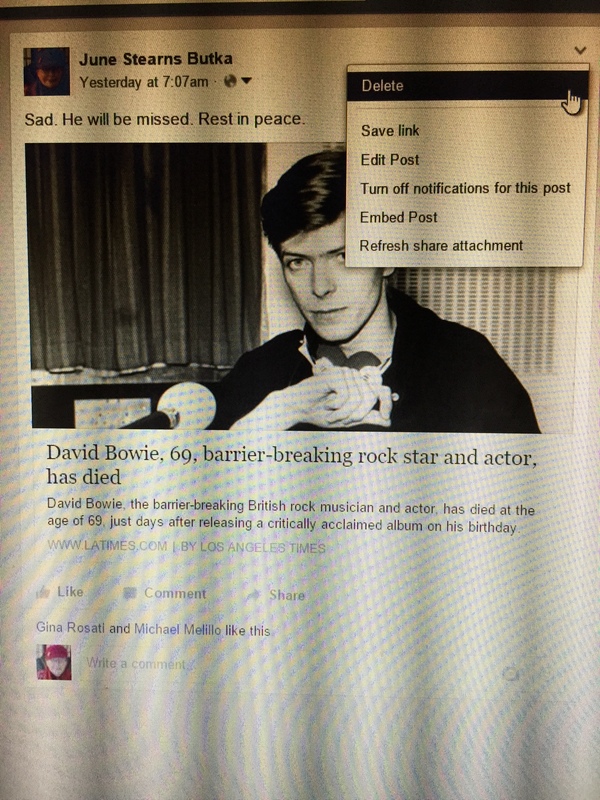 De-Clutter your e-mail and Facebook page. You will be happy you did. Previous Post Town or County Clerk-Oh, No!